Sean Dennis, left, and Ben Commerford, assistant professors of accounting, were awarded a major research grant to study artificial intelligence in the auditing profession. 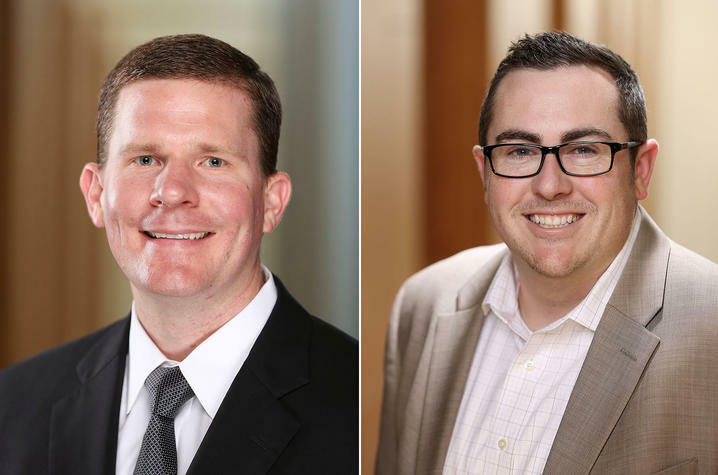 LEXINGTON, Ky. (June 27, 2018) — Sean A. Dennis and Benjamin P. Commerford, assistant professors of accounting in the Gatton College of Business and Economics, recently were awarded a major research grant from the Center for Audit Quality (CAQ) in Washington D.C. to study artificial intelligence in the auditing profession. Their project, titled “‘Alexa, Audit Loan Grades’: Enhancing Auditor Reliance on Artificial Intelligence Through Anthropomorphism,” is one of only four projects funded by CAQ this year. Over the past 10 years, the CAQ has provided funding for 39 projects of interest to the auditing profession through its Research Advisory Board (RAB) grant program. Gatton College Ph.D. graduate Marcus Doxey, assistant professor in the Culverhouse School of Accountancy at the University of Alabama, was awarded a CAQ grant in 2017. In addition to Dennis’ and Commerford’s project, the CAQ’s RAB, comprising members from academia and the auditing profession, selected proposals submitted by faculty from Emory University, North Carolina State University, Northeastern University, and the University of Missouri – Kansas City. The RAB grant program focuses on critical issues in the audit profession, and these four research projects will address subjects that are timely and relevant for how audits are performed.